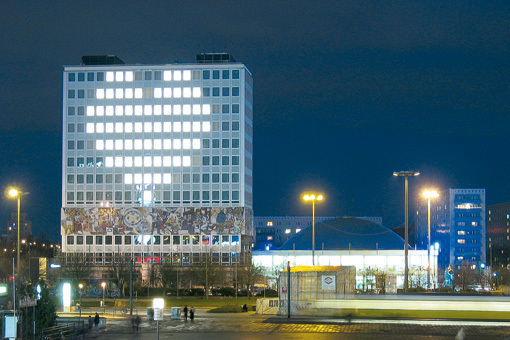 Light+Building (L+B) is an international fair that took place in Frankfurt (April 23 – 26). Seems to be interesting also in respect to mediafacades. I took a closer look at the catalogue: The following companies have shown interesting products or proejcts that could be usefull for mediafacades g-lec | you will see | grid type LED curtain, se-ag.ch Leurocom – Electronic Displays, Tryka L.E.D. Ltd – Home, Lumileds LED Lighting – Luxeon LEDs, ARKANZ – Home, ECKELT GLAS GmbH. In parallel to L+B there is a light art festival called Luminale with interesting projects. Here are some Pictures from Luminale. L+B is biannual event. Next fair is April 2008. There are two events about mediafacades, you shouldm’t miss, when you are in Vienna. Meet us there. LEDs integrated in glass. What about maintainance? Throw the whole window away once a led source is broken? The product is called Power Glass. Also in 2006 there will be a two day international conference and exhibition Urban Screens 06: Demonstrating the Potential of Public Screens for Urban Interaction. Some years ago Christian Möller, Joachim Sauter from ART+COM have published some interesting ideas for the EXPO in Hannover. They can be found at netzspannung.org. There’s a paper Das vierte Format: Die Fassade als mediale Haut der Architektur [PDF | 669 KB ] published in 2004. Speaking of Classics: Bix Mediafacade at Kunsthaus Graz, Austria. Take a look at the simulation software at bix webpage, that allows you to simulate how imagery will look like on the facade. This project has been shown at the Media Facades Exhbition Berlin 2008 and was published in the Exhibition Companion (download the Catalogue Pdf – 7 Mb). Blinken Lights seems to be a perfect start, though it’s not a typical mediafacade – but what is the typical mediafacade by the way. I like it that much because it’s devoted to the public and invites to interaction. Unfortunately the technical principle of Blinken Lights – which is bright halogen flood light behind a diffusion layer – seems only to make sense in buildings that are empty. Check out more at Blinken Lights website. This Animation was created by Djenia Beliaikin with Blinkenpaint 2.4, a open source software by CCC.